Here we go again. One would think I would be used to this by now, but I guess I’m not. The current “career consultant” for my daughter, Rebecca, isn’t going to work out. Time to go back up the chain of command and re-think this process…again. More red tape, more time wasted, more waiting for other people to decide what’s best for my daughter and how they’re going to handle a mom that won’t settle. Excuse me if I sound exasperated, but maybe some background information will help you to see why I feel this way. Becca is 22 years old and is looking for competitive employment. 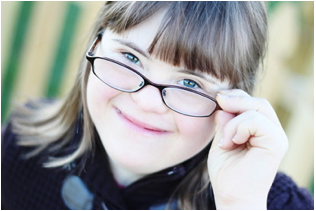 As most people are aware, the current job market in the United States isn’t that great, especially if you have Down syndrome or some other label. For the past three years Becca has been working with our state’s Vocational Rehabilitation office in conjunction with a couple of different local agencies to try to secure employment. We’ve spent a lot of time and effort on this. You might wonder, “What has happened as a result of all of those extra meetings, the time spent in job-site assessments, practicing how to answer interview questions, sitting in a library watching the consultant type for her, not much time spent actually applying for anything, and four different career consultants over the past three years?” Well, it’s pretty disappointing: several job applications submitted, one phone interview, one call to set up an interview which got cancelled when they found out she had a disability and a two-month stint at Papa John’s in a “carved-out” position. Hmmm…kind of makes you wonder if it’s really worth all of that time. Office Assistant (paid) for over 2 years part-time in a small office, filing customer records, completing form letters, and faxing time sensitive information. Screenprinting Assistant (paid) printing t-shirts for sports teams and schools. She volunteered for a pro-life organization, organizing donations of baby supplies to distribute to mothers in need. Library (volunteer) at a local elementary school. Hospital (volunteer) 1-2 times per week in the Central Distribution department, where she selects items to fill supply orders for hospital floors and departments. All of the above are places that I searched out, and I was the one who made the connections with people who were willing to give Becca a chance. As I look at this list, I see that I have been much more productive than the so-called professionals. Granted, I haven’t found her full-time employment, and not all of the experiences were used to their greatest potential; but I have found a lot of varied opportunities for her to gain real-world experience. That’s more than the professionals have done. Because she is quiet, needs to keep busy, and is a bit of an introvert, Ellen Doman and I always felt that it would be good to get her working out of the house more. We still do, but maybe the job is going to be done from home, and “out of the house stuff” can be volunteering and social events. Creates custom slideshows for birthdays, anniversaries, weddings, etc. She continues to learn about how to run a business, and up to this point it has been pretty small and somewhat inconsistent. It seems her mother (me!) has been a bit distracted trying to find employment in the “real world.” J However, maybe it’s time to really RUN with this business. I’m not sure what I’m waiting for…the next unproductive career consultant? …the next boring meeting? …the next job assessment?…the next person to limit Rebecca’s abilities? I think not. The waiting is over. I already have the best answer for her right now, a business tailored to Becca’s strengths with plenty of room for her to continue to learn, grow and expand her skills…and it’s PSB Cubed! As NACD has reminded all of us parents, we really are the experts of our children.